A police officer patrols during a protest in support of the Black Lives Matter movement in New York City on July 9, 2016. A Massachusetts mayor has refused to remove a Black Lives Matter banner from City Hall at the request of the local police union. The banner features the hashtag #BlackLivesMatter and has been hanging from Somerville City Hall since August 2015. 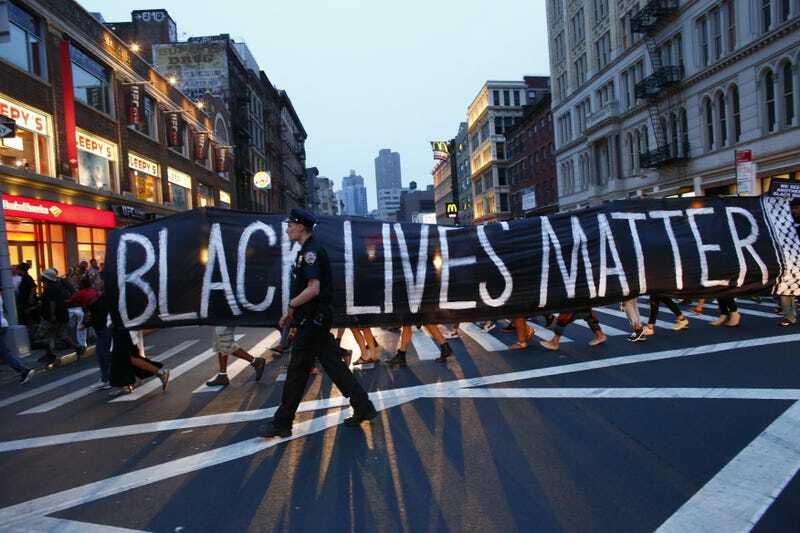 According to USA Today, the Somerville Police Employee’s Association recently published a letter to Mayor Joseph Curtatone asking for the banner to be removed and replaced with an “All Lives Matter” banner. But the mayor, although sympathetic to the recent killings of police around the country, is not taking down or replacing the sign. And it seems that not all police in the town necessarily feel the same way as the union. Somerville Police Chief David Fallon said he is “100 percent behind” the mayor’s decision. “We support the city’s initiatives,” Fallon said. He also said the mayor has always been a “staunch supporter” of the Police Department as well as a supporter of human rights. USA Today reports that the chief said he would like to facilitate a sit-down with the mayor, the union president and members of the Police Department to have a “serious and effective” discussion regarding the banner.